[D76] March 6, La Barra / Uruguay. 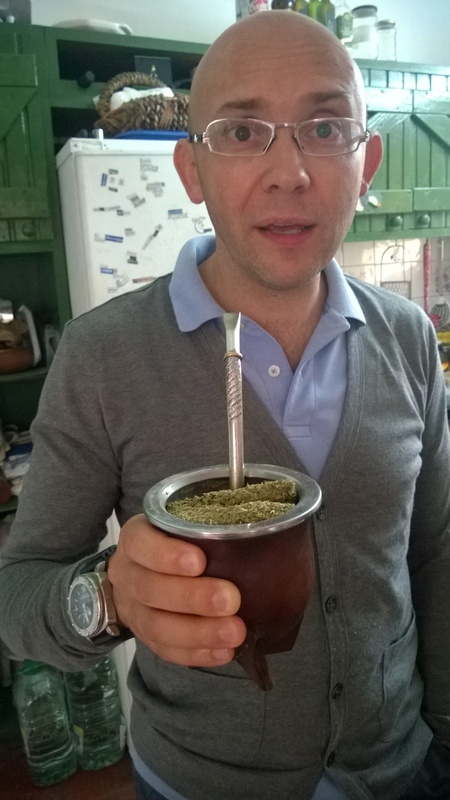 Ever since we arrived in Argentina, we have wanted to try their national drink: mate (to pronoce, put the emphasis on ‘e’, not to be confused with the word in Engish). 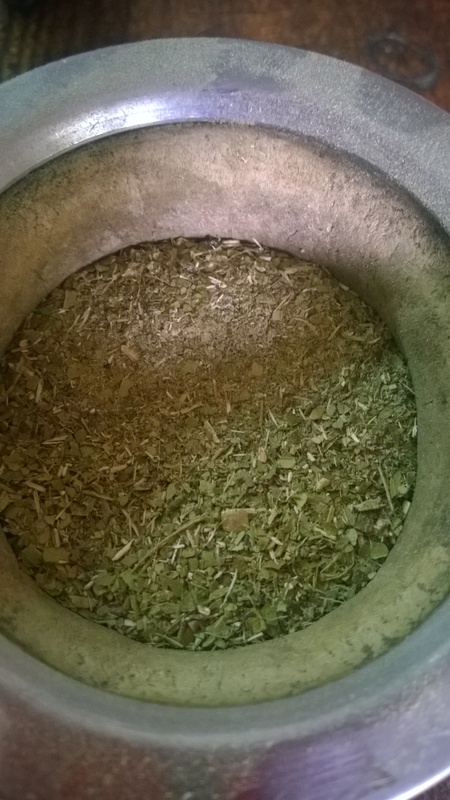 We saw people walking around, driving around, beaching around, discussing around, sun bathing around, studying around, traveling around with a special round cup (only later on I learnt this cup is called mate) with some greeen herb like mix inside, and a small bottle with hot water everywhere. It’s such a remarkable thing, they seemed to be more addicted to mate than Chinese to tea. There was even a whole museum in Montevideo with a big section dedicated to mate culture, with some extremely elaborated mate and accessories in display. But in all cafe, bar, and restaurant we asked, they shook their heads and said ‘none’. A month later, we arrived in La Barra, Uruguay, a beachside small town next to a popular tourist destination of Punta del Este, in a rented homestay through airbnb at Lucia and Jose’s home. They were simply amazing hosts, who went way out of their way for us. Among all things, they invited us to share mate with them!!!! They explained to us that Mate actually the name of the round hollow gourd, which is made from calabash (or long melon, or 葫芦) that is cut, carved, treated and became the base of the gourd. Then it’s completed by a leather cover, sealed by silver(?? Or some metal?) on the mouth. Lucia then started the ritual. She put the kettle on. 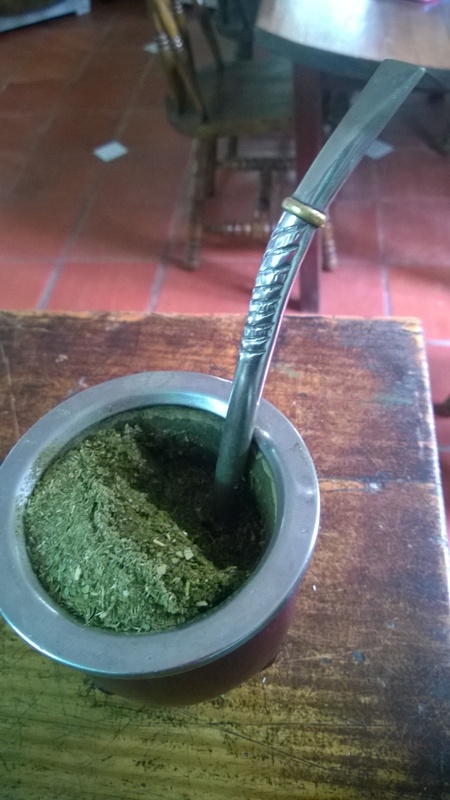 She poured some yerba (the chopped herb, which is from the family of holy) into the mate, and put in a bit of cold water for yerba to sink a bit as I was told yerba absorbs water like sponge. 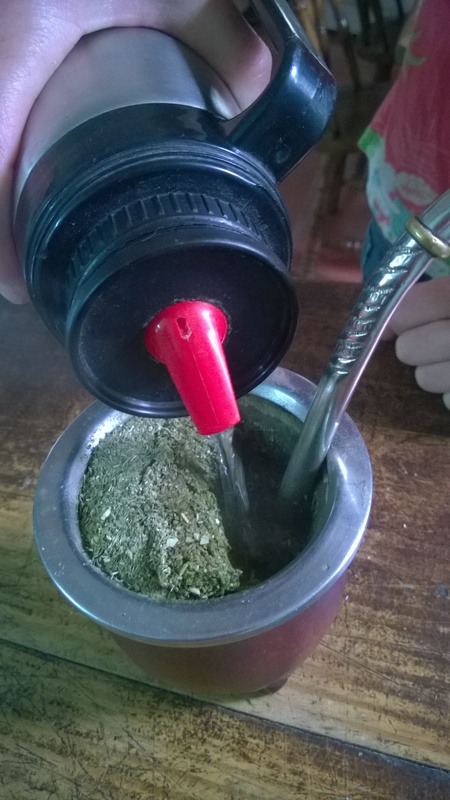 Then she pour some hot water in for the first person (normally the one who makes the mate) to start drinking. 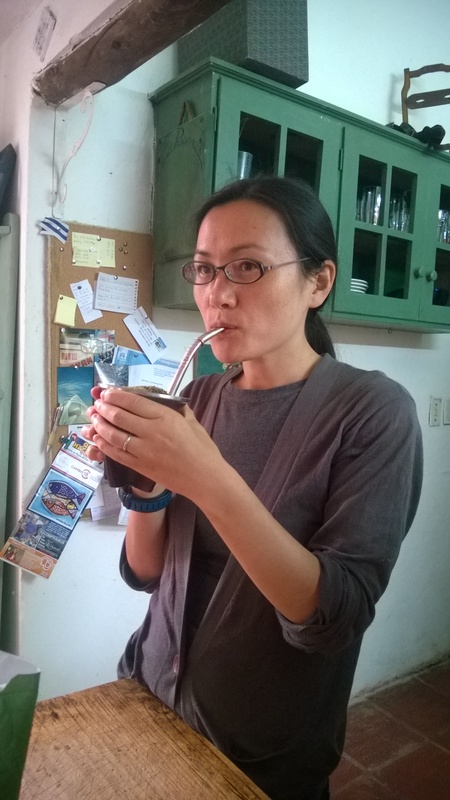 To drink, she used the bombilla (a metal straw, with lots of small holes in one end to dip into yerba so to avoid the yerba to be sipped). She sipped a few time till there was no more water (when she felt air coming through the bombilla). Then she poured some hot water in again ( always pour water from the same spot I was told otherwise it changes the taste!!) and passed onto the next person clock-wise. 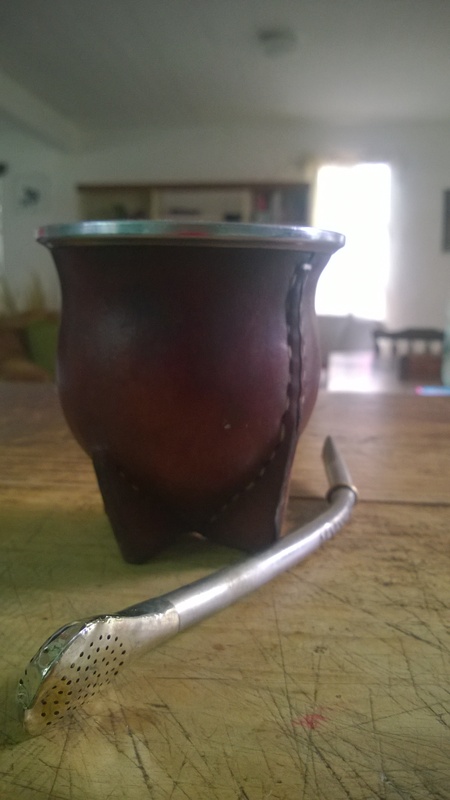 I was told it was always the owner of that particular mater who pours water, hence it explains why you cannot have mate in a cafe for example because there has to be an owner, and the whole ritual is very personal (well everyone uses the same bambilla). So we were extremely grateful for having been invited to share mate with them. When it was my turn, I made sure to take time to taste it. It tasted extremely bitter, with a bit of green tea taste. 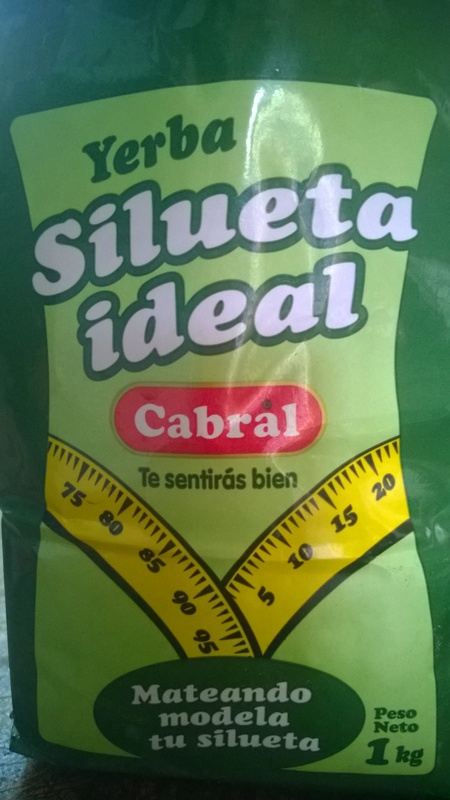 I could understand why people could get addicted to it because it had a very strong taste of its own. 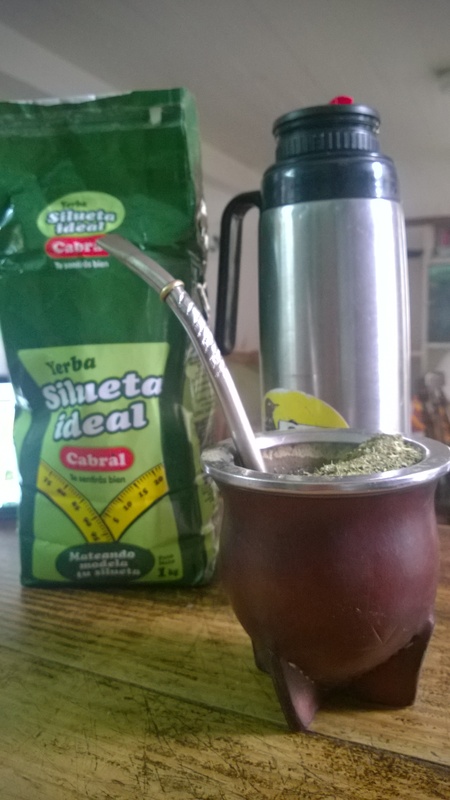 The next day, before Jose went to work, he prepared him a mate, and left with the mate, bombilla in it, and the thermal water bottle. That would make his day, he told me – mate was like a loyal friend of his, always accompanying him at work, when reading, or painting. It’s certainly a big part of people’s life here.